Technology is ever-evolving. Ten years ago, you would never have thought we would be where we are today. Just recently, Apple is (yet again) breaking grounds and making history in the world of Gadgetmania as it releases the latest model of their infamous iPhone - the iPhones 6 and 6 Plus. Innovation is at the core of creating a more sustainable (and enjoyable!) world for us. From chic bamboo speakers to solar-powered GPS tracking, everywhere is evidence of the inspired search for smarter, greener, cooler technology to improve our daily lives. In an effort to reduce potential e-waste, Apple is accompanying their release with the Apple Reuse and Recycling Program where you can get an estimate for your iPhone, Mac or iPad, ship it to their reuse and recycling partner, and - wait for it - get paid for doing so! With that being said, let's celebrate the ways in which technology connects us with the environment, and how it helps us in going the right direction towards our target to complete sustainability. 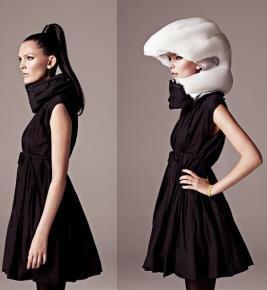 The Hövding airbag for cyclists is a revolutionary ‘helmetless helmet’ from a company known for quirky products that combine sustainability, fashion, and technology. The helmet has been extensively safety-tested and actually provides the best shock absorption in the world for cyclists. The best part? It comes in multiple cool designs, all made of waterproof and dirt-resistant fabric. Environmentally-conscious designer Anatoliy Omelchenko, of Triangle Tree, created the simple-yet-chic iBamboo from a single piece of bamboo. 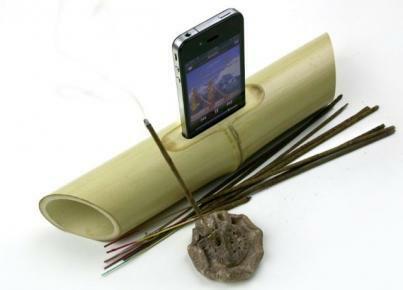 Production requires only a few alterations to the bamboo, minimizing manufacturing and energy waste. This remarkable speaker does not require electricity – with a convenient slot for the iPhone, it simply uses its natural hollow body to amplify the tunes! The Lumio Book Lamp is a compact, low-energy, foldable lamp in the shape of a book – with incredible adaptability! By turns a table lamp, wall sconce, pendant or reading light, the Lumio Book Lamp is adjustable to suit your needs. It’s also cordless, thanks to its rechargeable battery that provides up to eight hours of light. The Belkin Wi-Fi enabled WeMo Switch and WeMo Motion Kit provides you with wireless control of your home appliances and electronics, through sensory detection. The sensor is able to detect motion from up to 10 feet away and send a signal to the WeMo Switch to turn a connected device on or off, simultaneously saving you money in electricity bills and saving the planet. It’s a win-win! The beautiful iZen Bamboo Keyboard and Mouse set is fully handcrafted, environmentally friendly and biodegradable, due to its being made almost entirely of bamboo. 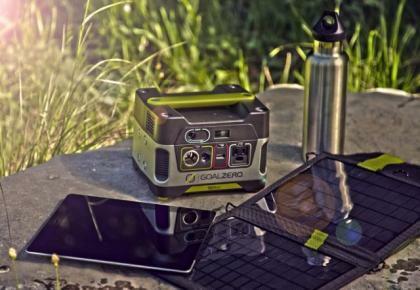 The Yeti 150 Plug-and-Play Solar Generator is a compact, gas-free source of portable power weighing just 13 pounds! Just think: for every 5 to 10 hours of direct exposure to sunlight, the Yeti 150 can provide enough power to light a lantern for 50 hours, power a smartphone for 15 hours or recharge your laptop…twice. The MoMA Bulb Flashlight features three interchangeable functions: a regular LED bulb, an emergency flashlight, and a socket lamp. It screws into any standard socket and produces as much as a 40W bulb using just 6W of electricity! How easy is that? These Bioplastic Phone Covers, available for iPhone 3G, 3GS, 4, 4S, 5, iPod Touch and Samsung Galaxy S3, are made using renewable biomass sources, such as plant starches and microorganisms, allowing you to protect your phone in style and with a clean environmental conscience. Never worry about neglecting your plants’ health again with this convenient sensor device; the Parrot Flower Power. By downloading the free app (available for Apple and Android devices), you can receive real-time alerts of your plants’ needs, such as soil moisture, sunlight, fertilizer and air temperature conditions. By simply planting the sensor next to your plant, indoor or outdoor, you can monitor up to 256 plants through your smartphone! Behold the world’s first self-powered GPS tracking device! No larger than the HK dollar coin and less than an inch thick, the Retrievor RET-100 will locate your phone, pet, or any registered object within five feet accurately. And, for your convenience, trackers can be viewed and controlled by web, Android, or iPhone apps.